A Roman Catholic priest at a Watertown parish, who served at St. Patrick's in Natick during the late 1990s, was placed on administrative leave this week while the Archdiocese of Boston investigates an allegation of child sexual assault dating back 20 years. The Rev. Frederick Barr, who most recently served at St. Patrick Church in Watertown, has been placed on administrative leave while the Boston Archdiocese investigates allegation of child sexual assault. The Rev. Frederick Barr served as a priest at St. Patrick's in Natick from 1997 to 2000, according to a spokesman for the archdiocese. Barr most recently has served at St. Patrick Church in Watertown. A spokeswoman for the archdiocese would not comment on whether the alleged sexual assault could have occurred during the priest's time in Natick, although it would seem to fall outside the 20-year span. A woman who answered the phone at the Natick parish yesterday referred questions to the archdiocese. The archdiocese refused to talk about the specifics of the allegation. Barr worked at St. Luke Church in Belmont from 1985 to 1990. A diocesan spokeswoman says civil law enforcement agencies have been notified, but would not be more specific. A Beverly native, Barr went to Watertown in 2008 after serving at St. John the Evangelist School in Canton. 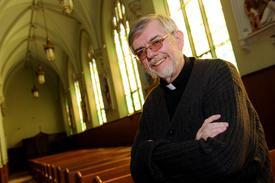 He was ordained as a deacon in 1975 after attending St. John's School of Theology-Seminary. John Beagan, a Watertown resident who has been going to St. Patrick's Church for five years, said news of the allegation was surprising. "Everybody would have to be shocked. Nobody would have had an inkling that something like this was coming down," he said. "I met with him Tuesday morning and there wasn't an inkling or a sign that there were any problems." When Barr came to St. Patrick's Church, Beagan said, he hit the ground running. "He came in kind of like a whirlwind. He's highly motivated," Beagan said. "For a person with physical health problems, you'd never know it with the way things just happened." "It has turned a corner. It's about hope. It's a sense of the future. We are moving on," he said.